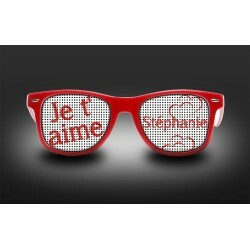 Customized Eyeglasses There are 4 products. Customize your eyeglasses with your own visuals. Discount prices !!!! Ideal to communicate, promote and celebrate ... customized eyeglasses (lorgnettes) are the most requested personal goodies ever ! How does it work ? Download your own visuals online and after 5 steps your lorgnettes will be ordered. You'll receive them in the upcoming days ! Customize your eyeglasses with your own visuals. Discount prices !!!! Perfect to tell your love to your favorite one putting his/her name on the right lenses of our eyeglasses (lorgnettes) How does it work ? Type the name of your lover online and after 5 steps your lorgnettes will be ordered. You'll receive them in the upcoming days !